Mohamed Salah set a new English Premier League record of 32 goals in a 38-game season to guarantee Liverpool's place back in the UEFA Champions League next season. 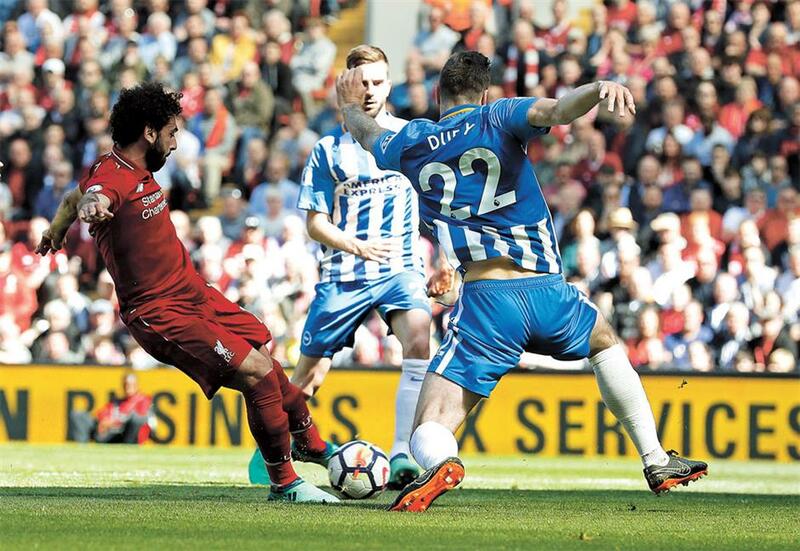 Mohamed Salah scores Liverpool’s first goal against Brighton and Hove Albion during their English Premier League match at Anfield in Liverpool, northwest England, yesterday. The goal was the Egypt midfielder’s 32nd in the EPL, setting a new mark for the most goals in a 38-game campaign. Salah went into the last day of the season at Anfield with a share of the record alongside Alan Shearer (Blackburn Rovers in 1995-96), Cristiano Ronaldo (Manchester United in 2007-08) and Luis Suarez (Liverpool in 2013-14). Liverpool won the match 4-0 to finish fourth in the EPL. Mohamed Salah set a new English Premier League record of 32 goals in a 38-game season to guarantee Liverpool’s place back in the UEFA Champions League next season by beating Brighton and Hove Albion 4-0 at Anfield yesterday. Victory for Liverpool meant it didn’t matter what fifth-placed Chelsea did at Newcastle United, but it failed to put any sort of pressure on the UCL finalist by succumbing limply to a 0-3 defeat at St James’s Park. At the other end of the table, Swansea City’s 7-season stay in the EPL came to an end as it joined West Bromwich Albion and Stoke City in being relegated to the Championship. Needing to beat Stoke, Southampton to lose to Manchester City and a 10-goal swing in goal difference in its favor, Swansea failed to even sign off with a win as it was beaten 1-2 at home by Stoke. Liverpool is aiming for a sixth European Cup when it faces the might of Real Madrid in the UCL final on May 26. But Juergen Klopp’s men know even if they fall short in Kiev, they will be back in the UCL next season as they blew Brighton away. Salah eased any nerves by swivelling to strike his first goal in 4 games on 26 minutes to take his tally in all competitions this season to 44. Liverpool was allowed to rest easy with Salah and Sadio Mane withdrawn before Andy Robertson added a fourth. Chelsea gave itself no chance of usurping Liverpool into fourth as it slumped to a 10th EPL defeat of the season in the northeast. Dwight Gayle and 2 goals for Ayoze Perez piled more pressure on Chelsea boss Antonio Conte just 6 days ahead of what could be the Italian’s final game in charge in the FA Cup final against Manchester United. Champion City has broken the EPL record for wins, points and goals this season and set another landmark by becoming the first side in English top flight history to reach 100 points as Gabriel Jesus struck a dramatic late winner to beat Southampton 1-0. That also meant City set a record EPL margin of victory of 19 points over United, which beat Watford 1-0 at Old Trafford. England manager Gareth Southgate will name his World Cup squad later this week, and there was plenty of encouragement for Southgate as 3 of his strikers were on target. Marcus Rashford scored his first goal since March for United’s winner, whilst Jamie Vardy and Harry Kane both struck twice at Wembley as Tottenham Hotspur came from 1-3 down to beat Leicester City 5-4 and hold off Liverpool to finish third. Erik Lamela scored twice and saw another effort deflect in off Christian Fuchs for an own goal to put Spurs in front before Vardy levelled with his 20th league goal of the campaign. However, Kane had the final say with his 41st of the season to head to the World Cup in fine form. Arsenal gave Arsene Wenger a parting gift in his final game as manager after 22 years in charge by winning its first points away from home in the EPL in 2018 with a 1-0 win at Huddersfield.